When Payton discovers that her father has MS, the shock that he is sick isn't nearly as great as her surprise at learning that she's been kept in the dark about this for the past six months. Even her older brothers have known about it the whole time. However, her family has kept it a secret because they felt she was overly sensitive and wouldn't be able to handle the truth. In shock and in anger, she gives her family the silent treatment. Her reward for this is getting sent to her High School guidance counselor for talk therapy. There, it is her counselor's idea that she needs to find something to focus on to journal about and sort out her feelings about her father's illness. But Payton finds it difficult to choose a worthy subject to center upon. 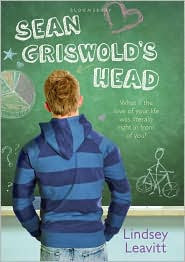 In desperation, she chooses to focus on the back of the head of Sean Griswold, a boy who sits in front of her in biology class. Her first entries are silly and frivolous, but gradually she starts learning more and more about her subject until Payton realizes that she is falling in love. An above average romance for younger teens. It gets some gravity from its topics of death, dying, and grief, but at its heart there's the romance, which doesn't have a lot of steam (the younger target audience probably doesn't need much -- it's all in the anticipation!). The subject of Payton leaning to cope with her father's illness is also handled pedantically (but again that's probably a requirement of the target audience). So where the story really shines is in Payton's appealing personality and some funny situations.